Wow! Twenty years? Now that's perseverance! I love your activities ... very thoughtful. Andrea, I love this book. The title was so captivating that I had to read it. Love your activities. Nancy's story is wonderful. Such great language and so pared down it works for primary kids as well as older ones. It's great to see a review of this book. I discovered it recently at my library, read it, and enjoyed it. I love the question you posed of how an opening through a mountain could change your life. I can already see the sea of waving hands and hear the chatter of countless children's voices ready to answer first. Thank you for your kind words, Leslie. It would be an interesting writing exercise, too. Maybe I'll try it today myself! This book is moving up on my TBR pile. Also, thanks for sharing your thoughts as an educator and providing activities to pair with the book. You're welcome, Jilanne! Thanks for stopping by! This is a great pick. The story is so inspiring! I love his persistence! Me too. A great story for anyone at any age! 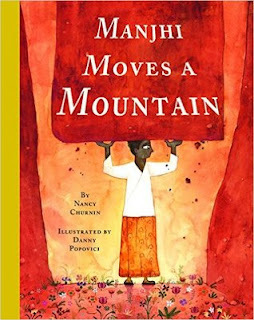 A wonderful book - to remind us that we all can move mountains when we try. Some of stone, some of prejudice.